After years of hunting, I have come to think that it is a relaxing and frustrating activity at the same time. Why? Well, after thorough thinking, it all came down to three main elements: the instrument that you are using, the period of the day in which you are using it and the will that you put into the process. The will, there is no question about that; I have it. The instrument, I had that down with my crossbow and its accessories. 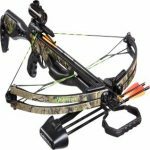 However, considering all these background details, we all know that one of the best methods in achieving your goal in hunting is using a good weapon – in this case, a crossbow. And the most challenging part of using it is figuring how to sight it in. Of course, if you are a beginner, it might take some time. 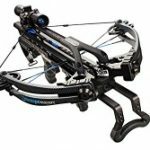 Even the professionals still ask themselves from time to time: how to sight in a crossbow? One of the most important aspects when using a crossbow for the first time is shooting 50-100 arrows before you’ll begin to sight your scope. This will teach you how to shoot tight groups of arrows from a 20-yard distance, even if they will land in the desired point or not. The good news is that the procedure will be the same, no matter what scope you’ll get. However, you should make sure that the one that you’ll choose will have some good optics. 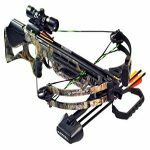 The trajectory refers to the distance that the arrow travels from its starting point, the crossbow, to its target as soon as it is dispatched from the bowstring. In its road to the sight, the arrow is constantly slowing down. This means that the further it travels, the faster it can fall to the ground. 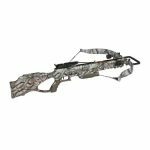 Now that you are already accustomed to your crossbow, the first thing that you need to know about sighting it in is having a flat trajectory. Thus, the arrow should intersect with the sight twice a time, so that you will have a center hold on the target without holding too much over or under. Given their installed height, the sights on a crossbow compensate for arrow drop. But concerning the fact that not all the sights are installed at the same height, not all of them will shoot the same trajectory, apparently. This is the moment in which we should mention one of the biggest advantages of a scope sight: they can be raised high above the flight by installing some higher rings. This will change the crossbow sight and will modify the trajectory into a flatter one. Now that we discussed about the technical issues, let’s look at other perspectives. Let’s say that we want to hunt a deer of around 120 pounds. Its heart/lung size would approximately have an area of 8 inches long. 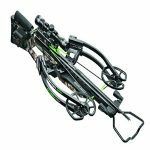 Thus, you’ll sight the crossbow’s maximum blank point range drop on 3 inches and the mid-range rise of 3 inches. Then, you should hold the dead center of the target. At this moment, if the sight setting is properly made, the arrow should strike the vitals of the deer. 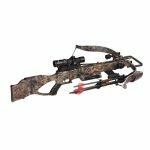 The maximum effective hunting range combines any target that is beyond maximum point blank range. For this, you should raise the crosshairs and the crossbow to adjust the additional arrow drop, keeping the target in the crosshairs. With these being said, one of the most important aspects when using a crossbow for the first time to make the best out of its sighting is to practice. If you’re passionate enough about what you’re doing and if this is really a leisurely activity for you, then there is no problem for you to learn.